Clockwise: A rotation in the same direction as a analog clock's hands turn. The term clockwise refers to a rotation in the same direction as analog clock hands turn. 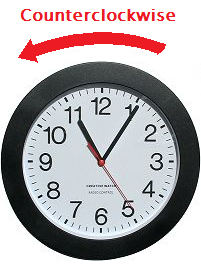 Counterclockwise is the opposite direction of an analog clock. In British English, anticlockwise means the same thing as counterclockwise. In British English, counterclockwise is called anticlockwise. Manipulative 1 - Clockwise/Counterclockwise Created with GeoGebra. McAdams, David E. Clockwise . 3/5/2019. All Math Words Encyclopedia. Life is a Story Problem LLC. http://www.allmathwords.org/en/c/clockwise.html.